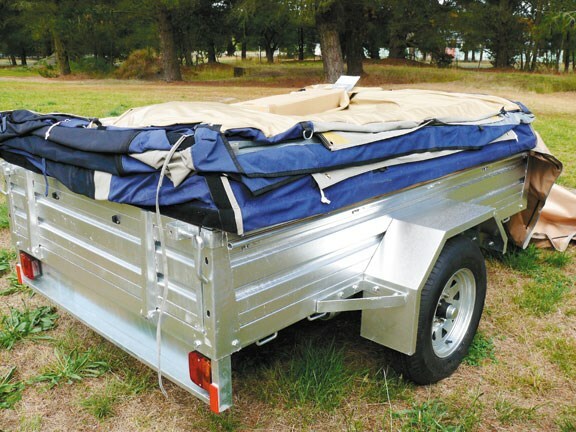 Camper trailers are substantial and rugged canvas tents that pack simply onto a compact trailer unit that can be lugged behind your average two-litre car. Oztrail is one of the biggest players in our market. Laying eyes on some Oztrail offerings for the first time, I’m struck by the generous dimensions. The smallest of the range offers 6.6m2 of minimum living space; the largest Camper 12 Twin (two-person, plus three) model doubles that. Every Oztrail can be extended. 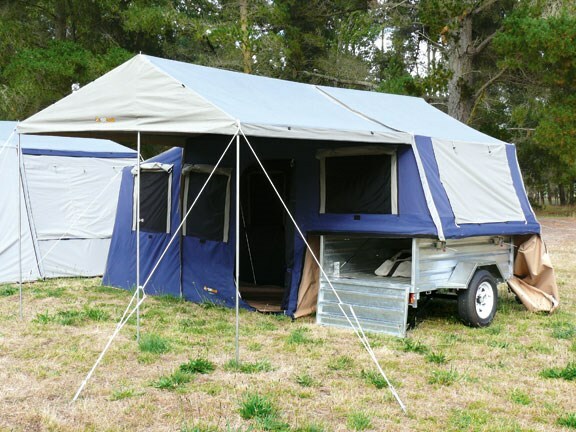 $750 purchases an additional wall kit that converts one of the two awnings into an extra room or – if you install just one wall – provides good shelter from wind. Tough zip-in PVC floor buckets for the second room and add-on areas will also be available later this year. As with any good RV or camping set-up, there’s plenty of scope for personalisation. The heavy 340 gram (12-ounce) canvas construction and heat-reflective roof keep the interior cool in the heat of summer. The added kicker is it’s impregnated with a strong water-repellent and should last a lifetime. Underfoot, the PVC floor is also much thicker than what I’m accustomed to, forget that woven tarpaulin material, this more durable and smoother surface is easy to sweep and keep clean. The set-up is one of the areas where Oztrail excels. Trust me – a whoa-to go set up time of five minutes really is no exaggeration. 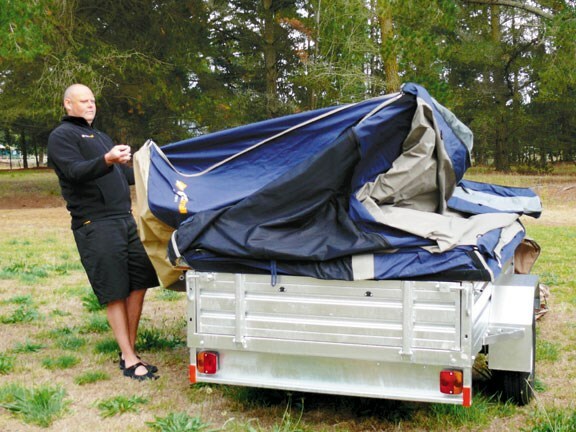 Whip off the waterproof cover (you could also store those fiddly bits like camping chairs and camp kitchens under there) and the tent flips out. The initial lift is a bit heavy for one but doable and, once tilted past the balance point, it drops down toward the floor simply. Just peg in the floor and adjust the collapsible, fully galvanised poles to full height and you’ve comfortable accommodation and more fishing time. No need for an airbed, as atop the trailer is the wooden base with a closed cell foam mattress. The real bonus item is the portability and storage thanks to that trailer component. As the tent sits on top of the trailer, there’s plenty of room for all the supplies inside it. A rear tail gate allows for unpacking once the tent is up and the bed base lifts up with hydraulic assistance to grant handy internal access. 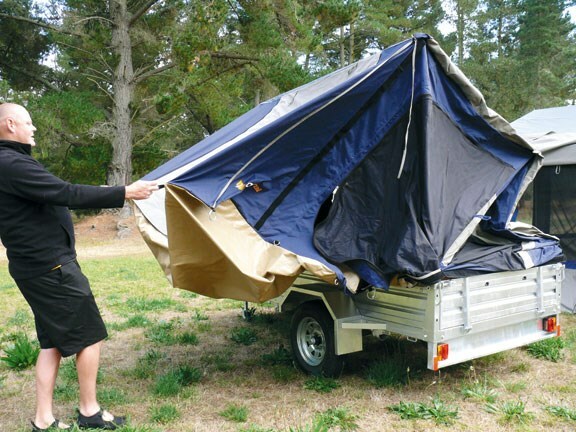 Six bolts and the tent part lift off so you can use it as an everyday garden trailer too. 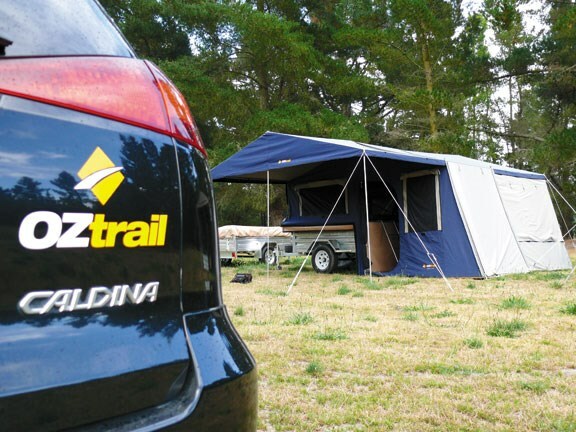 If you do the math this all makes the Oztrail product great value compared with other camper trailers on the market. A good canvas tent these days runs you about $2000; a trailer, another $1500 easy. So the $4999 start price for Camper 6 (two-person, plus one) isn’t at all an unreasonable proposition. 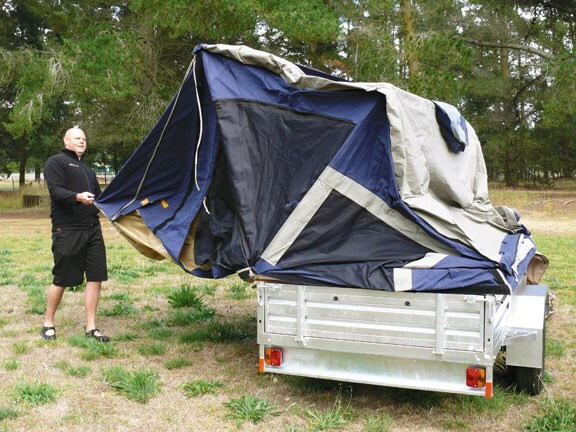 Towing the 7x4, 500kg tent/trailer around Christchurch is easy, my wife has never towed before but I doubt this would be a worry for her at all. It’s maybe not the one for the real offroad adventurer, though a deluxe trailer option does provide slightly increased ground clearance, so it’ll still go 90 percent of places the average punter will need it to. 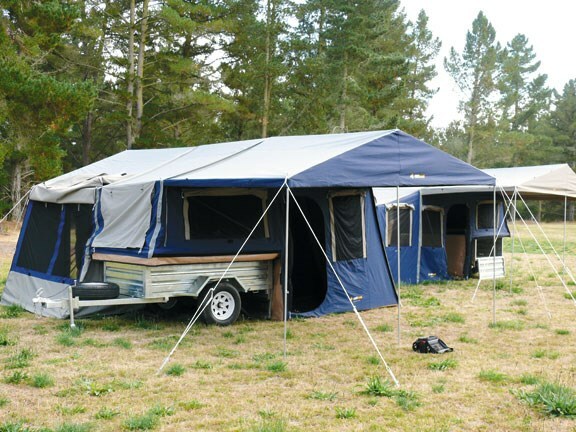 See camping trailers for sale here.